The city's housing map, created by the Market Value Analysis. The only such map where darkness equates to wealth. A citywide housing policy is a complicated one to build. Dallas must incorporate economic development and education while reckoning with the policies of our past. On January 17, the Dallas City Council heard what it should already know. The Market Value Analysis, a database and report by the Philadelphia-based lender and research group known as The Reinvestment Fund, had discovered the hard data needed for Dallas to make more informed decisions on neighborhood revitalization and where to get the most bang for its incentive bucks. The analysis should surprise no one. With the exception of areas of Oak Cliff, Dallas’ poorer areas by every measure are south of Interstate 30. Residents lack education and job prospects, which translate into lower salaries, cheaper and less-maintained housing, and a lack of business infrastructure like shops, services, and entertainment. The reasons are equally unsurprising. The best guide for reasonably-priced housing in Dallas are often the redline maps that banks oversaw for almost 40 years. Those maps delineated where mortgages were often simply unavailable. Without the ability to get home financing at reasonable rates, housing prices plummeted to the value of what a buyer could pay in cash. It was only in 1968 when that odious policy was officially stopped. Officially. And while some 20 organizations took part on this report’s steering committee, none was a bank. Last year I peppered some bankers about southern Dallas and their lack of business there. When I pointed out that decades of bank-driven redlining was a direct cause of southern Dallas poverty, you could have heard a pin drop. The pin stayed on the ground when I continued that southern Dallas deserved the banks’ penance. We should all know redlining was actually “black-lining.” The neighborhoods deemed “Definitely Declining” were already or were becoming the black and brown sections of Dallas. And white folks, believing melanin to be contagious, abandoned areas adjacent to these often newly black areas. This only spread the problem. And as Frontburner once pointed out, those nearly 40 years of damage have barely improved for southern Dallas. However, the story for Dallas north of I-30 was different. Those areas rated “Definitely Declining,” including Uptown and much of Oak Lawn, have now returned to prosperity. This Market Value Analysis was a first step in trying —again—to fix the problem. Councilman Philip Kingston, of downtown and Uptown and East Dallas, pointed out that Dallas has the lowest median income of any U.S. city over 1 million residents. Of the city’s past attempts, he said, “We’re fake, we’re hypocrites,” in part because Dallas has more than 1,000 housing vouchers that landlords won’t take. Figure 1: Housing types A-I relates to home values with “A” being the best, most expensive. Our capitalist society has a bad habit of placing no value on people with no money. And so, of course, race and money are intertwined. It’s funny that in the graph above, white people are “green”, just like the money— and housing desirability—they represent. And the minute whites aren’t the majority, they run fast. 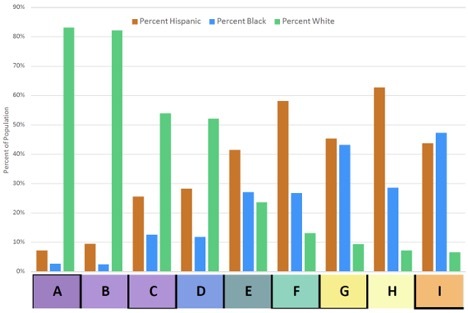 Looking at “D” and “E” housing, we see white residents plummeting about 30 percentage points between the two categories. Caucasians come to a rest below 10 percent for the lowest three housing types. This shows we don’t mix well, but also that Caucasians earn so much more that there simply aren’t as many stuck in poverty. The reverse is true for blacks and Latinos. Housing type “E” is interesting as almost a middle-of-the road, nirvanic melting pot. It’s based on properties with a median selling price of $140,300 (a lot less than “D” but just $22,700 more than “E”). Owner occupancy rates of 13 percent highlight the tons of apartments in these areas. This is further illustrated by “E” having the highest household density citywide (households in a defined area). In part, this tells me that race is less important when we’re renting, but also that some of the racial mix comes from a higher percentage of subsidized housing. Because there are relatively few purchasable homes in “E,” it also hints at white renters in “E” purchasing homes in higher bands while minority renters tend to buy in poorer areas. What we don’t know is how age factors into this equation. Youth seem less concerned with race overall. To summarize, in Dallas, the browner your skin, the less you earn. The less you earn, the fewer opportunities are available to your children. Those children grow up with less, including a poorer education, resulting in an inability to earn more. Rinse. Repeat. For generations. What was once racial redlining is now economic redlining with the same results. What’s the solution? Money and focus. The solution is simple but requires some orchestration and, of course, the political and financial will of northern Dallas – each habitually in short supply. The goal can’t be a million-dollar home for everyone. There will always be jobs and family dynasties that generate wildly disparate incomes. Equally true, we can’t simply gentrify southern Dallas. Doing that just moves the poor elsewhere, a lesson we should have learned from Uptown. And let’s be clear. No one wants to be poor. Poverty isn’t aspirational. Figure 2: Building code violation liens. Darker equals higher levels. First, increase the minimum wage to a living wage that’s automatically tied to inflation, removing the question from political gaming. More money in poor people’s pockets will be spent well. They will repair their homes, buy new furniture, and upgrade their transportation. How do I know this? 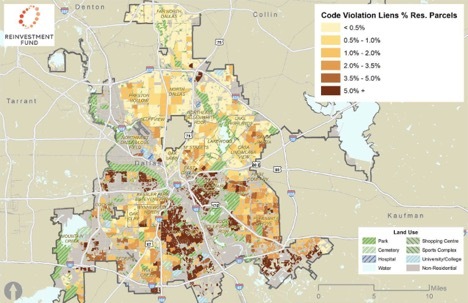 Southern Dallas has the highest levels of building code violation liens. Yes, some of those are likely absentee landlords, but most simply can’t afford to get a new roof or paint. If they could, they wouldn’t have the lien. Just as poverty isn’t aspirational, neither is a leaking roof. So more money needs to float around in these neighborhoods. More money equals more disposable income, which brings services, shops and restaurants. Did you know that while there are three Home Depots between I-30, I-35E, and LBJ, there are none between I-30, I-35E, and I-20? If enough money was there, Home Depot would be there too. In other words, decently-paid employment begins to create a cycle of money moving through the system. Before you decry a higher minimum wage that you think would drive goods prices higher, let me remind you that, one way or another, you’re paying. In 2013, Texas spent $23 billion on various assistance programs ($20 billion came from the federal government). That money helped millions of the working poor; two thirds of it went to working families. Paying those needy families more for working gets them off the public dime, saving you tax money. 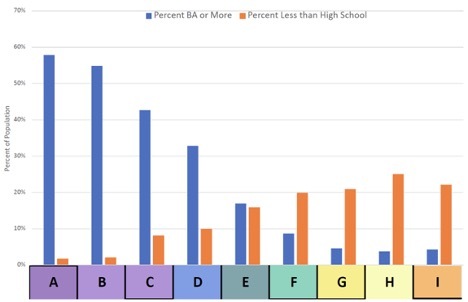 Figure 3: Education equals money. In concert with getting more money moving south, the Dallas Independent School District must focus on delivering a quality curriculum that grows graduation and college-bound rates. Part of this might focus on specific trades (vocational schooling) with steady, higher, non-offshoreable incomes. They must extend education to younger pupils (daycare, so parents can work) and offer quality meals. And some of this is already in the offing from DISD. By 2025, DISD wants every eligible three- and four-year-old enrolled in a pre-K program. This year, its program for three-year-olds will expand to 50 more schools. The district is also partnering with corporate sponsors (like AT&T) as well as the Dallas County Community College. Students learn the skills they need to get a job at those companies after graduation, and, at the same time, earn college credit. It goes without saying that the networking opportunities are equally valuable as the taught skills in facilitating these students’ full employment in decent jobs. Definitely the right direction by DISD. This is probably the trickiest piece. If a downtrodden area becomes “hot,” wealthier people move in and price-out existing residents. If the city gets Fair Park right (big if), it will create a flurry of trend-chasers moving into the area, driving up prices. Fine. Gentrification is another way to bring money, and these areas need money. But the city must equally have a plan on where those displaced people go … that’s affordable. Again, if existing residents have more money in their pockets, more can afford to stay or have better options when moving. There are ways to address this. In the last legislative session, State Rep. Eric Johnson, D-Dallas, tried to get a law passed that would’ve capped property taxes on existing residents in booming neighborhoods, a response to the displacement of low income families near Trinity Groves. It failed. Another option includes sprinkling (not concentrating) affordable housing throughout northern (white) Dallas. Believe it or not, this would have enormous benefits for everyone. Lower-income workers in northern Dallas could afford to live near their jobs, which would cut their transportation costs, freeing up disposable income to spend locally (win). Lower-income workers would feel more part of the city and take more pride (win). Wealthier residents, unaccustomed to seeing the less well-off living normal lives, gain some empathy (“The Grinch’s small heart grew three sizes that day“) and feel less threatened by the poor (win). Crimping Dallitude is a worthy cause. How do I know this? The gays. Years ago they were highly concentrated in sometimes artfully-named gay ghettos like Chicago’s Boystown (now listed on Google Maps), Washington D.C.’s Bouffant Circle, or Harlem’s Lilac Heights. In our case, we typically had the cash to live elsewhere, but felt safer away from a public that often feared and despised us. Flash-forward and we comfortably live openly all over the region. Of course, white gays had and have an easier time than minority gays. North Dallas Council member Lee Kleinman suggested creating a credit system where developers would have to have a certain number of affordable housing credits to build a project. Those credits would come from affordable units within the project, but also by purchasing credits from other areas in need of funding. He envisioned an exchange where credit prices were set by the market. On the surface it seems a riff on Transferrable Development Rights. But there’s a danger here too. First, there is a potential for wealthy folks to buy their way out of diversity. The first hour of a worker’s day shouldn’t be eaten by transportation costs. Second, I wouldn’t want to see the funding apportioned in a way that perpetuates low-income ghettoization. Third, some cities using similar systems have no actual place for the affordable units to be built, so developers pay into a kitty that somehow never really gets spent. All these are avoidable consequences if you want them to be. When there is more money in the system, all boats rise. Poorer people, whom the wealthy complain about not pulling their share (as they dodge their own taxes), would start paying their way. Federal and municipal tax revenues would grow and at the same time public assistance should slack. It would likely reduce crimes committed from need or a feeling of disenfranchisement. And finally for the capitalists, business would grow from the new customers created … Home Depot would boom not only from less-poor people buying paint and shingles, but also the resulting Caucasian run on security systems. The MVA offers hard data to back up anecdotal evidence about where Dallas can get the biggest bangs for its bucks. The MVA’s data is crucial in targeting dollars at need. As a city we can finally, honestly begin tackling a problem so many have never followed through on. Of course we could also continue down Dallas’ historical course as summarized by council member Kingston and continue as “hypocrites” who offer little more than lip service and food stamps. The choice is ours.